The New Carolingian Modelbook: Counted Embroidery Patterns from Before 1600. Albuquerque, NM: Outlaw Press, 1995. TNCM is 200+ page compendium of resourced line and block unit patterns for embroidery, knitting, mosaics and other crafts; sourced to specific historical references. Includes sections on stitching techniques, history; and indexes by area and date of origin. Although it is out of print, copies trickle onto the used book market and can be found on Amazon (linked above), and eBay. 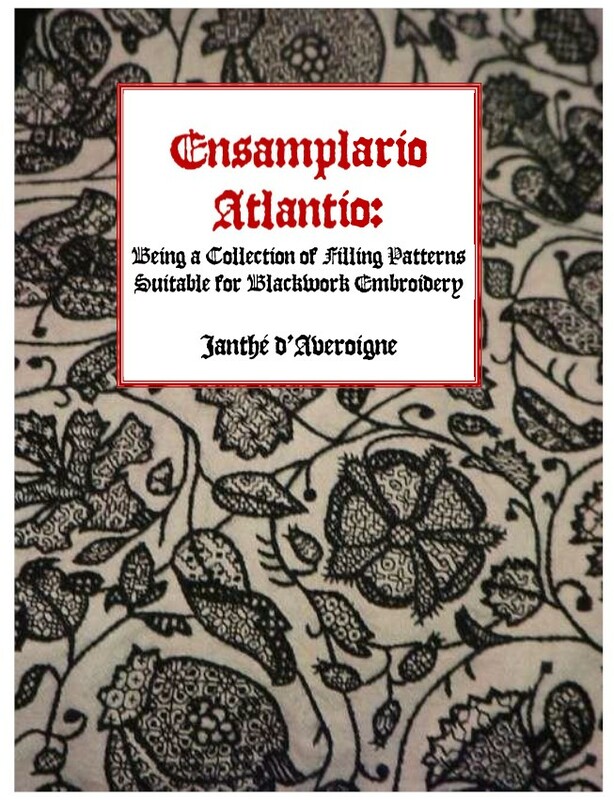 Ensamplario Atlantio: Being a Collection of Filling Patterns Suitable for Blackwork Embroidery. Arlington, MA: Black Rose Press, 2011 (self published). EA is a collection of over 220 graphed line unit patterns suitable for use as fills in blackwork embroidery, or as all-over or field fills. It’s available for free download here at this website. The Second Carolingian Modelbook: More Counted Embroidery Patterns from Historical Sources. Arlington, MA: Wild Puma Press (forthcoming). TCM2 is in process right now. With 65 plates, it will be an extensive collection of graphed line unit and block unit patterns useful for embroidery, knitting, mosaics and other crafts; all sourced to specific historical references. The designs do not duplicate those in TNCM. Thanks! With retirement arriving end of 2012, I’m going to feast on these patterns! delighted to be of use! I get a thrill out of seeing what mischief the “pattern children” get up to out there in the wide, wide world. Please feel free to send along pix of projects employing them. If you give permission, I’ll post them in the gallery here, too, with thanks and links if so desired. -k.
Thank you so much for your generosity in sharing your work. I just downloaded the PDFs of your book, as well as your amusing modern patterns (skulls and fsm). I have been trying to find some resources to experiment with blackwork and your site is amazing. I’m in the middle of a few projects right now, but I’ll be sure to share with you whenever I do manage to get to put your charts to use. 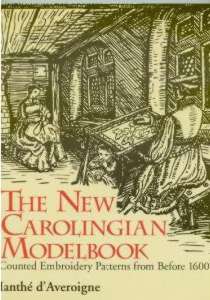 The cost of The New Carolingian Modelbook: Counted Embroidery Patterns from Before 1600. is prohibitive – $50 used and $191.50 new. Perhaps it could go on Kindle or some other alternative to make it more available? There was no ‘look inside’ for it either – that would have been nice. Just from reading your blog and looking at your patterns, I can tell it should be a very interesting book! Thank you for blogging. Jean, Thanks for your kind words. I’m afraid that I’ve got no contact with the TNCM publisher. He only paid me a couple of months of royalties before dropping off the face of the earth. The book went on to sell at least 2000 additional copies, but I’ve never seen a cent, nor do I have the files needed to do a Kindle-fication. In fact, all I’ve got is my one author’s copy. But be that as it may – I am concentrating right now on putting out a sequel. Once The Second Carolingian Modelbook is out, I’ll turn my attention to re-manufacturing the first. Sorry for the inconvenience. -K.
Thank you for your reply – I saw it only just now. You have given us hope – that is good! Bless you. Thank you so much for enabling the downloading of your Ensamplario Atlantio – what a magnificent resource! I know I will love going through the patterns, and I will someday send you photos when I make something from your book. This is the best blackwork pattern sourcebook I have ever seen! Thank you so much for your work, and for sharing it so generously with the world. I also look forward to going through your past blog entries in depth.